A Yayoi jar, first-third century, excavated in Kugahara, Ōta-ku, Tokyo, Tokyo National Museum. The Yayoi period (弥生時代, Yayoi-jidai) is an era in the history of Japan from about 800 B.C.E. to 250 C.E. It is named after the section of Tokyo where archaeologists first uncovered artifacts from that era. Some archaeologists mark the beginning of the Yayoi period by the start of the practice of growing rice in a paddy field, others by the appearance of a new style of pottery. The Yayoi is identified as the first culture in Japan to cultivate rice and to manufacture and use metal implements and ceremonial objects. Following the Jomon period (10,000 B.C.E. to 300 B.C.E. ), Yayoi culture flourished in several regions from southern Kyūshū to northern Honshū. Wet-rice cultivation came to Japan from the Yangtze estuary in China, and it is thought that the Yayoi people are largely descended from Chinese or Korean immigrants, intermingled slightly with the Jomon people they supplanted. The cultivation of rice allowed the development of a sedentary agricultural society and the eventual establishment of a stratified social structure with a powerful elite class. Some archaeologists mark the beginning of the Yayoi period by the start of the practice of growing rice in a paddy field, others by the emergence of a new style of pottery. The end of the Yayoi period and beginning of the Kofun period is marked by the appearance of keyhole-shaped burial mounds. However, remains of rice and rice paddies have been found in Jomon sites dating to around 1000 B.C.E., several centuries earlier than the pottery associated with Yayoi sites. Discoveries of older key-shaped burial mounds coincide with pottery from the end of the Yayoi period, making a precise definition of the culture difficult. Recent discoveries suggest that the Yayoi period may have started as early as 900 B.C.E. A new study using the Accelerator Mass Spectrometry method to analyze carbonized remains on pottery and wooden stakes from the Yayoi period, discovered that these dated back to 900–800 B.C.E., nearly five hundred years earlier than previously believed. These artifacts came from the northern region of Kyūshū, and to further confirm this finding, artifacts from Korea and Jomon earthenware from the Tohoku region of the same time period as the initial study were compared, with the same results. Another researcher used other artifacts from similar Yayoi period sites and found that these were dated back to 400–500 B.C.E. Reconstructed grain storehouse. 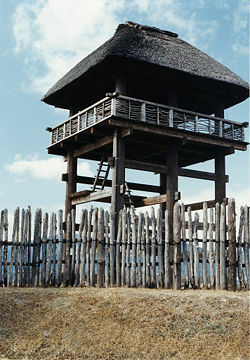 Reconstruction of Yayoi period remains at Toro in Shizuoka, Shizuoka Prefecture, Japan. The earliest Yayoi people are believed to have first emerged in northern Kyūshū, later moving on to the main island of Honshu, where they largely displaced the native Jōmon, though there was some mixing of the two distinct genetic stocks. Though rice cultivation and the use of metal tools and objects are also characteristic of the Yayoi culture, the majority of the archaeological evidence is pottery, and it is through pottery that the Yayoi chronology has been established. Although Yayoi pottery was technologically advanced compared to that of the Jōmon, it was more simply decorated. The Yayoi also made bronze ceremonial bells (dotaku) decorated with incised geometric designs and stick drawings; ceremonial bronze weapons; swords; spears; halberds; and bronze mirrors and coins which resemble those of the Chinese Han dynasty. By the first century C.E., they had begun using iron agricultural tools and weapons. Yayoi pottery was unglazed. In the Early Yayoi period (250–100 B.C.E. ), pottery was ornamented with knife-incised surface decoration, and comb-mark decoration appeared during the Middle Yayoi period (100 B.C.E.–100 C.E.). Pieces produced during the late stages of the Yayoi period were often undecorated. The finished vessels were a russet color and included tall footed vessels, large and small jars, bowls and spouted vessels. Yayoi pottery appears to have been made on a pottery wheel, but was actually made by the coil method, by forming the clay into a long rope and coiling it upwards. The technique is an outgrowth of Jomon pottery, with refinements introduced from Korea. Surfaces were smoothed with a tool or paddle, painted red and polished to a high finish. There appear to be two types of Yayoi pottery, found in eastern and western regions geographically divided by the Inland Sea. The bronze pieces, however, suggest that the Yayoi culture was divided into a western area in northern Kyushu, a central area around Kinki, and an eastern area around the Kanto Plain. The introduction of an irrigated, wet-rice culture from the Yangtze estuary in southern China led to the development and eventual growth of a sedentary, agrarian society in Japan. (Recent DNA studies of the Japanese rice species have shown that it did not come to Japan from Korea, as was originally thought.) As the Yayoi population increased, their society became more complex and sedentary. They wove cloth, lived in permanent farming villages, constructed buildings of wood and stone, accumulated wealth through land ownership and the storage of grain, and developed distinct social classes. However, unlike in Korea or China, political and social developments in Japan took place on a local rather than a central level. Most Yayoi archaeological sites indicate that villages had a number of square pit-dwellings, reminiscent of the Jomon culture, with thatched roofs reaching to the ground and hearths in the center of the earthen floors. 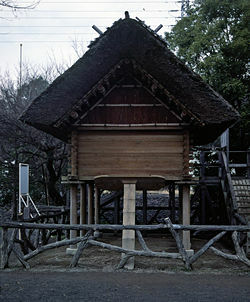 There are also buildings with raised floors, predecessors of the architecture of modern Shinto shrines, which may have been rice storehouses. These structures were probably introduced along with the culture of rice from the area around the lower Yangtze River in eastern China. (However, similar structures have also recently been discovered in Jomon villages.) Some villages were surrounded by ditches, thought to be a means of defending against attackers. Burial grounds were located near the villages. The mot common form of burial during the Yayoi period was a small trench in the middle of a square, ranging from a few square meters to four hundred and even nine hundred square meters, surrounded by a moat. Over the burial trench was a low mound, a precursor of the later Kofun burial mounds. Many late Yayoi burials were in round enclosures, and the mounds evolved into the keyhole shape which marks the boundary between the Yayoi and the Kofun periods. Artifacts recovered from Yayoi sites mainly include pottery, iron-bladed wooden tools, stone adzes, reaping sickles, and iron knives. Yayoi farmers cultivated peaches as well as rice, and supplemented their diet by hunting, fishing, and gathering wild plants. In western Japan, by the Middle Yayoi period, surpluses of rice allowed a highly structured class society and, by the Late Yayoi period, the emergence of a powerful and dominant elite class. The earliest written records about people in Japan are from Chinese sources from this period. Wa (Japan, 倭), the Japanese pronunciation of an early Chinese name for Japan, was mentioned in 57 C.E. ; the Na state of Wa received a golden seal from the Emperor of the Later Han Dynasty. This was recorded in the Book of Later Han (Hou-Han Shu). The seal itself was discovered in northern Kyūshū in the eighteenth century. Wa was also mentioned in 257, in the Wei zhi (The Records of Wei), a section of the San Guo Zhi, a Chinese historical record. Early Chinese historians described Wa as a land of hundreds of scattered tribal communities, not as the unified land with a 700-year tradition represented in the eighth century work, Nihongi, a part-mythical, part-historical account of Japan which dates the foundation of the country in 660 B.C.E. Third century Chinese sources reported that the Wa people lived on raw fish, vegetables, and rice served on bamboo and wooden trays, clapped their hands in worship (something still done in Shinto shrines today), and built earthen grave mounds. They also maintained vassal-master relations, collected taxes, had provincial granaries and markets, and observed mourning. The society was characterized by violent struggles. A woman, known as Himiko in Japanese, ruled an early political federation known as Yamatai, which flourished during the third century. While Himiko reigned as spiritual leader, her younger brother carried out affairs of state, which included diplomatic relations with the court of the Chinese Kingdom of Wei (220–265 C.E.). When asked about their origins by the Wei embassy, the people of Wa claimed to be descendants of King Taibo of Wu, a historic figure who founded the first Wu Kingdom (吳國) around the Yangtze Delta of China. (Original Chinese from the Records of Wei: 「倭人自謂太伯之後」). A theory publicized during the early Meiji period argued that the Yayoi culture was brought to Japan by migrants from Korea. Many Western and Japanese scholars have concluded that archaeological findings from the Yayoi period "clearly derive from Korea." These include "bounded paddy fields, new types of polished stone tools, wooden farming implements, iron tools, weaving technology, ceramic storage jars, exterior bonding of clay coils in pottery fabrication, ditched settlements, domesticated pigs, jawbone rituals, and megalithic (keyhole) tombs." This theory is supported by the fact that Yayoi culture began on the north coast of Kyūshū, where Japan is closest to Korea. Yayoi pottery, burial mounds, and food preservation was discovered to be very similar to that of southern Korea. In addition, there was a significant Japanese population in southern Korea (Gaya) around 300 C.E., with both nations today claiming the other was a vassal. In addition, "[m]any other elements of the new Yayoi culture were unmistakably Korean and previously foreign to Japan, including bronze objects, weaving, glass beads, and styles of tools and houses." However, some argue that the increase of roughly four million people in Japan between the Jōmon and Yayoi periods cannot be explained by migration alone. They attribute the increase primarily to a shift from a hunter-gatherer to an agricultural diet on the islands, with the introduction of rice. It is quite likely that rice cultivation and its subsequent deification allowed for mass population increase. Archaeological evidence supports a mass influx of farmers from Korea to Japan, overwhelming the native hunter-gatherer population. Direct comparisons between Jomon and Yayoi skeletons show that the two peoples are noticeably distinguishable. The Jomon tended to be shorter, with relatively longer forearms and lower legs, more wide-set eyes, shorter and wider faces, and much more pronounced facial topography. They also have strikingly raised browridges, noses, and nose bridges. Yayoi people, on the other hand, averaged an inch or two taller, with close-set eyes, high and narrow faces, and flat browridges and noses. By the Kofun period, almost all skeletons excavated in Japan, except those of the Ainu and Okinawans, resemble those of modern day Japanese and Koreans. Genetic evidence also supports this theory. The Ainu are believed to be descendants of the Jomon people, with some intermingling of genes from Yayoi colonists. The Yayoi culture emerged suddenly and was very advanced compared to the Jomon-period culture it replaced. It introduced skills to Japan such as the manufacturing of bronze and copper weapons, bronze mirrors, bells, as well as irrigated paddy rice cultivation. The most notable fact that lends evidence to the claim that the Yayoi culture was brought by immigrants from China is that three major symbols of the Yayoi Culture—the bronze mirror, the sword, and the royal seal stone—are exactly the same symbols used by Qin Dynasty China. In recent years, more archaeological and genetic evidence has been found in both eastern China and western Japan to lend credibility to this argument. Between 1996 and 1999, a team led by Satoshi Yamaguchi, a researcher at Japan's National Science Museum, compared Yayoi remains found in Japan's Yamaguchi and Fukuoka prefectures with those from early Han Dynasty (202 B.C.E.-8 C.E.) in China's coastal Jiangsu province, and found many similarities between the skulls and limbs of Yayoi people and the Jiangsu remains. Two Jiangsu skulls showed spots where the front teeth had been pulled, a practice common in Japan in the Yayoi and preceding Jomon period. The genetic samples from three of the thirty-six Jiangsu skeletons also matched part of the DNA base arrangements of samples from the Yayoi remains. This finding, according to the Japanese team of scientists, suggests that some of the first wet-rice farmers in Japan might have migrated from the lower basin of China's Yangtze River more than 2,000 years ago. This information appears to confirm historical Chinese accounts that when the Wei Dynasty sent an embassy to Yayoi Japan, the people there claimed to be descendants of King Taibo (太伯) of Wu, (呉), a coastal region on the Yangtze Delta that includes present-day Jiangsu, Shanghai and Zhejiang. The practice of rice farming, that was once believed to have been passed from China through Korea to Japan, is now thought to have been passed from southern China through Okinawa into southern Korea. The different physical types of people living in Japan today can be explained by changes in diet and way of life. The fact that the Japanese are a relatively homogenous people (with the exception of the Ainu and Okinawans) suggest to some that the bulk of Japanese did not originate from China. Although this last theory is popular with Japanese people, who would prefer to believe that they do not share significant genetic material with their Asian neighbors, it is the theory least subscribed to by modern day professional anthropologists specializing in Japanese anthropology. The next archaeological period in Japan is called the Kofun period, which is the first part of the Yamato period. Yayoi society developed into a society with a dominant military aristocracy and patriarchal clans, characteristic of the Kofun era. This change was quite possibly facilitated by immigration from the mainland. ↑ Fukuoka City Museum, Chinese Seal. Retrieved April 23, 2007. ↑ Walter Edwards, Event and Process in the Founding of Japan: The Horserider Theory in Archeological Perspective, Journal of Japanese Studies, Vol. 9, No. 2 (Summer, 1983), pp. 265-295. Retrieved April 23, 2007. ↑ Jared Diamond, Japanese roots. Retrieved April 23, 2007. ↑ Jared Diamond, Japanese Roots, DISCOVER Vol. 19 No. 6 (June 1998). Retrieved April 23, 2007. ↑ Bill Caraway, Ch 2—Tales of Three Kingdoms, Korea in the Eye of the Tiger. Retrieved April 23, 2007. ↑ The Japan Times, Yayoi linked to Yangtze area. Retrieved April 23, 2007. ↑ National Science Museum, Japan, Long Journey to Pre-historic Japan. Retrieved April 23, 2007. Long Journey to Prehistorical Japan (in Japanese) by the National Science Museum of Japan. Yayoi Culture by Charles T. Keally. Yayoi Culture at the Metropolitan Museum of Art. Article "Japanese Roots Surprisingly Shallow" from Japan Times. Yamato Wa at Korean History Project. Hidden Korea at PBS (Public Broadcasting System). This page was last modified on 30 July 2013, at 20:30.